Feet (and shoes) have been in focus this week. With the opening of our new studio “in The Moment” we are faced with how to ask people to remove their shoes before they come into the studio. We have found signage to be ineffective. It seems that nowadays we are so bombarded with messages, that we become oblivious to things that are often staring us in the face. So people are breezing past the signs and into the studio. What to do? 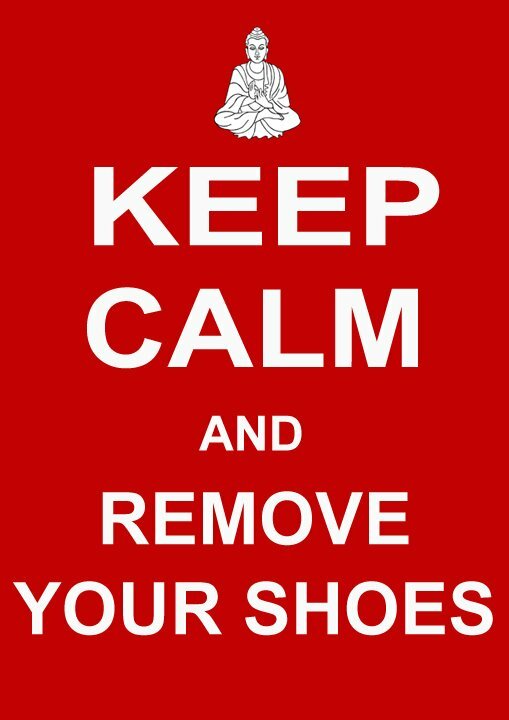 My sister came up with a light hearted “Keep Calm and Remove Your shoes” notice in the vein of those popular WW2 posters. But it seems that it is not just the signage that is the issue. It is our relationship to our shoes (and feet). There are a few things going on as far as I can see. 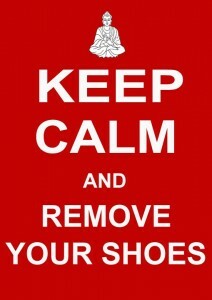 Firstly, people are reluctant to remove their shoes and socks because it is a faff. It’s January in Glasgow, so even I was sighing at my choice of lace up snow boots this morning! When you’re wearing flip-flops in the Indian subtropics it’s easy! Secondly, I think maybe some people are not convinced that we really mean it. Thirdly, lots of people HATE feet. Hate touching them, hate looking at them. Hate other people’s feet, hate their own feet. But the fourth and final reason is perhaps the most significant. Maybe people don’t understand why we want them to take their shoes off. And perhaps that is my fault for not explaining. So here it is. Of course we are a little but precious about our new floor which could be easily damaged by the wrong footwear but there are other reasons for asking people to remove their shoes. The most obvious one, perhaps, is hygiene and (dare I say it) health and safety. Really, who wants to roll around on a floor that has been in contact with shoes that have been walking the streets of Glasgow? Have you seen those pavements? Because we practice in bare feet and walk about on the floor in bare feet we want that floor to be clean and free of dirt. The following is a list of just some of the substances that, as a teacher, I have encountered on floors and you have to guess that some of it has come off of shoes. Glass fragments (cut foot), dog poo (at least I hope it was dog) cigarette ends, drawing pin (straight through my yoga mat and into my backside! ), chewing gum, mud, snow, sand, toilet roll, grit, small stones, leaves, a dead slug, biscuit crumbs (lots of those), hair, glitter, small insects, blood and toenails…and those are just the things we can see! Perhaps more significant is the yogic view. We remove our shoes to practice yoga and practice in bare feet. Although I often have a heck of a job getting people to part with their socks, which takes us back to the feet-hating issue. If you hate your feet, then I am here to help you learn to love them, to love the whole of you in fact. The feet are our foundation. We connect to the Earth through the feet. Shoes reduce this awareness. Balance and coordination comes through true connection to the body’s own, unfettered anatomy. Many studies have been done to show that the human skeleton responds best to running, jumping and standing on feet as nature intended. Whilst I don’t expect you to walk on the pavements in bare feet (see above) I do want you to feel the freedom of toes that you can wiggle. Simply put, we do stuff with the feet in yoga. The feet are a much neglected set of extremities. Changing our relationship with our feet, our foundation, can change a lot about how we see ourselves, and the world around us. So I invite you to take off your shoes and socks and feel the freedom of going barefoot – without worrying about what you might stand on! Many yogis also believe that shoes are “impure”. In any temple, yoga shala and even shop inIndia(and many other countries) shoes are removed before entering the building. For Yogis, a Yoga studio is not just a convenient floor space to exercise in. Genuine yoga teachers will seek to create a sacred space. A safe space in which people can explore Yoga as a spiritual discipline. The ultimate insult in many cultures is to raise one’s shoe or show the sole of one’s shoe to someone. In India, one NEVER points the soles of ones feet at, or places ones feet on a deity, priest, guru or teacher or altar, or even the symbolOM(which, strangely, I have seen printed on many westerners’ yoga mats!) Because we wish to create a sacred space at In The Moment, we ask people to respect this by removing their shoes. So there you have it – you see – we’re not just paranoid about our new floor. Over to the other side of town… where they want you to put shoes on! I said it was a week for feet. My sister, a well known contemporary dancer, choreographer and teacher, has been banned from wearing her socks in a particular dance studio. This is believed to make the floor slippery for the ballet dancers (bless them). Contemporary dancers, like yogis, like to work in bare feet but the rough lino floor in that particular studio cuts into bare feet (no such discomfort on the beautiful floor at In The Moment) so socks are their solution. Shoes are a no-no. Anybody familiar with contemporary dance will understand that the proposed solution of wearing soft ballet shoes would have the blessed Martha Graham spinning in her grave! On a slight tangent – I wondered if a recent advert I saw for “Fitness Yoga” (what?) where attendees were invited to wear their training shoes, might have a few of our respected Gurus doing likewise!